Atotech announced that it will present and exhibit at Semicon China 2018 to be held in Shanghai from March 14 to 16, 2018. On Friday, March 16, from 11:30 to 11:45 am, Cassandra Melvin, Global Product Manager for Semiconductor Advanced Packaging and Functional Electronics Coatings at Atotech Deutschland GmbH, will present MultiPlate®, Atotechs new tool for next generation power semiconductors, at the New Tech Stage in Hall E.
MultiPlate® is a new electroplating system which fulfills the requirements for next generation packaging in power semiconductors in HEV/EV and e-mobility industry, such as increased reliability and better energy and heat management. The system enables a more efficient and cost effective solution for embedding power chips with simultaneous metal deposition on both wafer sides, allowing for thick Cu deposition up to 50µm for optimized heat dissipation. It improves manufacturing efficiency by reducing the number of process steps by 25%, which also leads to 25% less costs per wafer. At booth number N5 #5551, visitors to the show can discuss this and other key solutions designed to address next generation packaging solutions with Atotech’s experts. Highlights at the booth will include Xenolyte® Zincate UA2 and Spherolyte® Cu UF3 for next generation packaging. Xenolyte® Zincate UA2 is Atotech’s universal pretreatment process for all types of Al and Al alloy wafers. The process removes the oxide layer of Al, replacing it with a zinc layer of several nanometers. It is compatible with all solder mask and resist types and contains no harmful, volatile ingredients. Spherolyte® Cu UF3 is a high purity ECD Cu process. 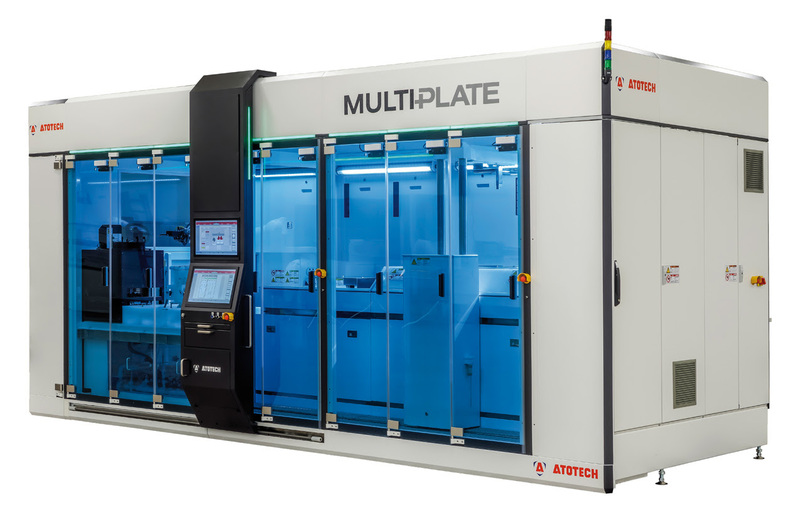 The three additive system is designed for plating sub 5 µm lines and spaces and large Cu pads, while simultaneously enabling via filling. It significantly reduces the level of additive incorporation and minimizes the risk of microvoid formations, thereby reducing Cu line breakages after thermal cycle testing. Semicon is one of the most influential and premier gatherings of semiconductor professionals making it an essential platform for companies like Atotech to showcase their solutions there. The show will be held at the Shanghai New International Expo Center in Shanghai, China. Visitors to the show are invited to attend Cassandra Melvin’s presentation on MultiPlate® and meet Atotech’s specialists at booth number N5 #5551 to discuss next generation packaging solutions. Atotech is one of the world’s leading manufacturers of specialty chemicals and equipment for the printed circuit board, IC-substrate and semiconductor industries, as well as for the decorative and functional surface finishing industries. Atotech has annual sales of USD1.1 billion. The company is fully committed to sustainability – we develop technologies to minimize waste and to reduce environmental impact. Atotech has its headquarters in Berlin, Germany, and employs more than 4,000 people in over 40 countries.